Spokesman: Egypt "in many ways represents the heart of the Arab world"
WASHINGTON (CNN) -- President Obama will deliver a speech June 4 in Egypt on America's relationship with the Muslim world, White House Press Secretary Robert Gibbs announced Friday. 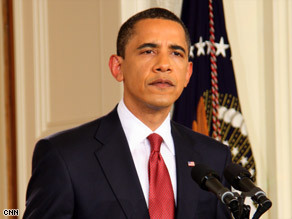 President Obama will travel to Egypt next month to address U.S. relations with the Muslim world. Egypt is "a country that in many ways represents the heart of the Arab world," Gibbs said. He deflected several questions at his daily briefing about whether Egypt is a wise choice, given President Hosni Mubarak's resistance to making his government more democratic. Obama originally promised to deliver the speech during his first 100 days, but senior administration officials say the date slipped in part because of security and logistical issues. The officials stressed, however, that the Secret Service still has deep security concerns, given the continued tumult in the Mideast. Obama chose Turkey, a more secular state, as the site of his first presidential speech to a Muslim majority nation, on April 6. He told the Turkish legislature in Ankara that the "United States is not and will never be at war with Islam." Obama will follow his visit to Egypt with a trip to the remains of the Buchenwald concentration camp in Germany on June 5. He is then scheduled to take part in ceremonies commemorating the 65th anniversary of the World War II Allied landings in Normandy, France.